Harlan Promontory 2012 awarded ‘#1 Wine of the World’ by Guide de Vins! Thierry Desseauve has spent his life tasting wines, meeting vintners and exploring vineyards on behalf of Guide de Vins. Surprisingly, he doesn’t often get the opportunity to discover an extraordinary wine he has never tasted or heard of before. That is, until he came across the 2012 Harlan Promontory. Describing it as a ‘wine of impressive power but also perfect balance, laid on top of a bright freshness, silky tannins, and a focused texture without equal’. He went on to explain, ‘the nose was one of a great Pauillac – notes of cedar and Havana, along with intense hints of small red fruits – but on top of this, a layer of fine spices with great persistence.’ In summary, it is an incredible wine that gives off an ‘extremely harmonious sensation‘. Originating out of the foothills of the Napa Valley mountains in California, the wine is made by Bill Harlan and his son Will. 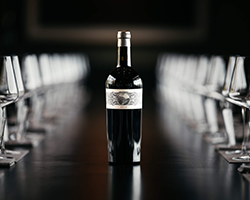 The Promontory’s first release was in 2009 and every vintage since has formed its own distinctive personality which seduces the consumer and allows the vintage to truly express itself. 2012 is, according to Thierry, the most complete and most extraordinary of them all. We are very fortunate to stock this wine considering that the 2012 vintage is the only one available outside the USA. View the Harlan, Promontory 2012 online now.